On Wednesday, I made tuna noodle casserole for dinner. I would definitely classify it as comfort food, wouldn't you? This recipe is super easy and super delicious. I recommend trying it ASAP! -Big Cat Diary. Bandit was on the bed with me at this point and he was VERY interested the big cats on the screen. Pretty sure he made some noises at them. -The Crocodile Hunter. When this came on, Bandit moved to the corner of the bed and went to sleep. He wasn't interested again until the last fifteen minutes. I see his priorities. -Sherlock! I didn't watch any of the most recent season which is, I know, shameful. I watched the first episode of season two yesterday and let me just say: AMAZING. -Parks & Recreation. I watched like six episodes because I can never get enough. Not. Ever. In other news, I am have plans to see Pitch Perfect with Amanda and Laura this evening. I was worried I wouldn't be able to go due to sickness. I was also worried that they wouldn't want to be near me due to my potential contagiousness. Neither of them are bothered by this, thankfully, so I am getting super excited about that. Woo! Where did September go? It's basically almost over, right? Goodness. I saw some trees that looked like they had changing leaves the other day. I'm excited about that part of things. I am prepping to make an apron for the little Duck this weekend. I'm pretty excited about it. I'm sure that I will post once it is complete. Unrelated: have you seen previews for that Bruce Willis/Joseph Gordon-Levitt movie, Looper? I have been having just the hardest time grasping the fact that that is actually Joseph Gordon-Levitt. FOR REAL. How does he look like that? I'm so confused. If I see that movie, I will probably just stare at him the whole time, trying to figure it out. Ridiculous, right? Also unrelated: did you know that the President is left-handed? I did not, but I just saw a campaign commercial that showed him writing and he totally is. Thanks for taking the time to read this little bit of randomness. That is all. Friends, last week I impressed even myself. 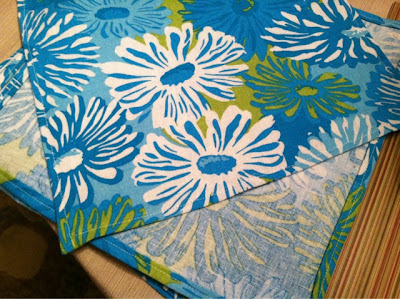 In one evening, I whipped up a beautiful little table runner for our dining room table in just one evening. 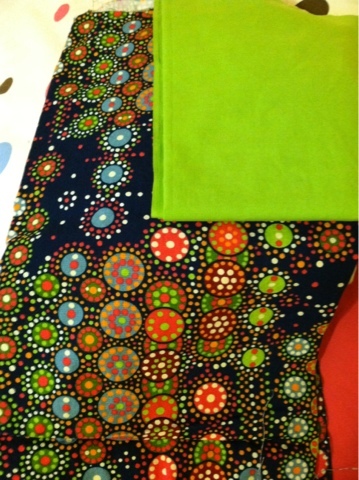 I had gotten the fabric (both were remnants! score!) at Joann's a few weeks before when I was out with Boyfriend's mom. I knew right away what I wanted to make with it. My mom made me a sweet little autumn table runner last year. It was printed with various colored fall leaves and had a brown backing. When I was visiting my parents, I talked to my mom about how she made hers and decided to put my knowledge to good use. After ironing the two pieces of fabric, I put them together, good side to good side (although, with the green, there really wasn't a "good side"). After a bit of trial and error with my sewing machine, I got some navy thread ready to go and I stitched around the whole she-bang except for one little section that was about two inches long. The key to the whole thing! Can you see my pins? Cute times. So, the key. With that little two inch whole in the end, all I had to do was turn the whole thing inside out by pulling it through the whole. I imagine I will need to sew up the whole at some point, but for now you can't even tell it's there. I ironed the whole thing to give it crisp edges (I took this fairly blurry picture before I did that...) and laid it on our gorgeous early 1960s dining room table. 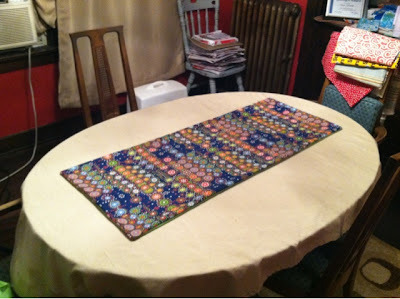 I think I will not keep the table cloth on the table when I actually use it, though. Haha. Can you see that little blue chair in the top middle of the picture? The one next to the radiator? That will be a project soon. I want to strip the already chipping paint off and repaint it and make a cute cushion for it. It has that little place for a cushion, so that's basically a requirement. I'm looking forward to it! I have so many projects in mind for the near future, I can hardly contain myself! As promised, It is now time to (briefly) discuss my super secret surprise trip to North Carolina to visit my parents!! I had first thought of my plan in May. I wanted to make it work out so I could come sometime in June to coincide with my mom's birthday. That plan ended up not working out, so after our family reunion in July, I got to thinking about it again. I ended up buying the plane tickets at the end of July. It was basically torture to wait that long before I actually traveled. Oh man. Finally, the day arrived and I made my way to the airport! My dad left work to pick me up and, because he is awesome, told my mom he needed something from home so she would come at the appointed time. He had actual work to do so I tried (key word: tried) to stay calm and not talk at a super high speed. I think I ended up bouncing up and down near the window for a while. I finally saw my mom pulling into the parking lot and got into position. When she came around the corner to my dad's office, she saw me sitting in a chair directly in front of her. She was clearly surprised. Her jaw dropped and she said, "What in the heck are you doing here?!" It was classic. Below, you can see us right after she arrived at the office. The three of us went to lunch after this and, when my dad had to go back to work, my mom and I did a little shopping. It was a nice day. 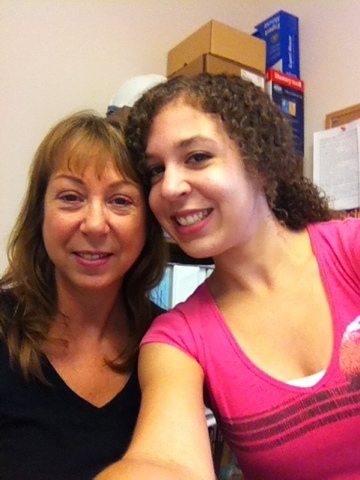 On Friday, my dad had to work, so my mom and I went downtown and explored a bit. 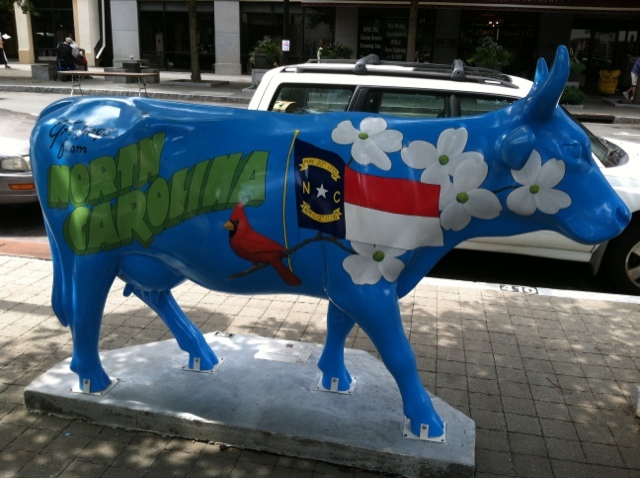 We went to the visitors center, got a map of the downtown area, saw this colorful cow below, and hopped on the free bus toward an historic neighborhood I wanted to check out. 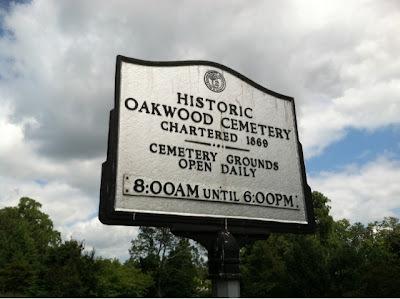 We wandered our way through the neighborhood of Oakwood until we reached the Oakwood Cemetery. It was pretty huge. 102 acres, I think, even though they are only using like 70 right now. There was an impressive Confederate section to look at, and we also saw the grave of Margaret Mitchell's first husband, supposedly the basis for Rhett Butler in Gone with the Wind. Pretty nifty, if you're into old cemeteries. Haha. On Saturday, my dad didn't have to work, so the three of us went to the Ava Gardner museum, which wasn't too far away. She is from a small town in North Carolina. Did you know that? The museum was great and we really enjoyed ourselves. We also checked out a few stores in the nearby outlet mall and had some lunch before heading back to the house to hang out. 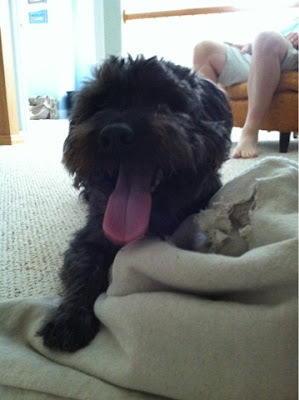 Below is a picture of my fuzzy brother bear, Jack. He's the best. He seemed to enjoy having me around. Unfortunately, Sunday came very quickly. We checked out a huge farmers market and had some lunch before the parents had to drop me off at the airport. 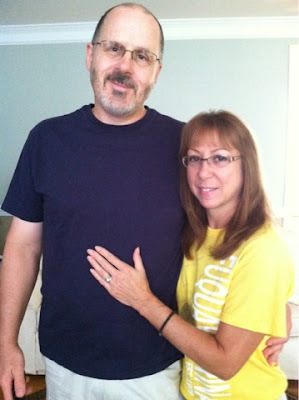 They are pictured below before we left the house. Aren't they just the cutest? I might be biased, but whatever. I'm so glad that I got to make this trip, and that the surprise worked out well. It was nice to get away for a few days and spend time with my parents. It was, of course, also nice to come home (because isn't it always?). I would like it if everyone I love were closer to me and to each other geographically, but we can't have everything, can we? At least North Carolina is closer than Idaho! So, Boyfriend gave me a sewing machine for my birthday. Did I tell you? Either way, I am pretty thrilled about it. I bought a bunch of fabric remnants at Joann's (50% off! woo!) 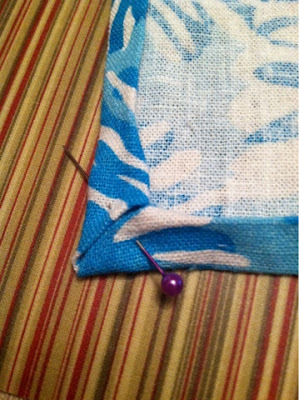 and spent some time practicing stitches and making little pouches and such. Boyfriend even made something! It was his first time using a sewing machine, but he did an awesome job making a little case for my phone. Haha. 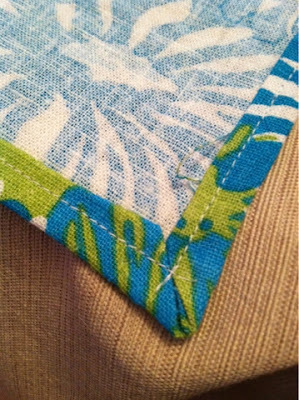 Anyway, my first major project was to make cloth napkins. I used a tutorial from Skip To My Lou, which made the whole process really simple. I used one of my larger remnants for these. My napkins ended up being like 11 inch squares (or so), which is smaller than I would have really liked, but I'll take it. I also didn't really realize how much folding, measuring, pinning and pressing would be involved in this process. I mean, I knew there would be some, but man. It took forever! It took longer to do all of those things than it did to actually sew the darn things! I used the mitered corner instructions. It was interesting and it took some time, but I think it turned out nicely. And, finally, here is a good shot of the fabric I used. 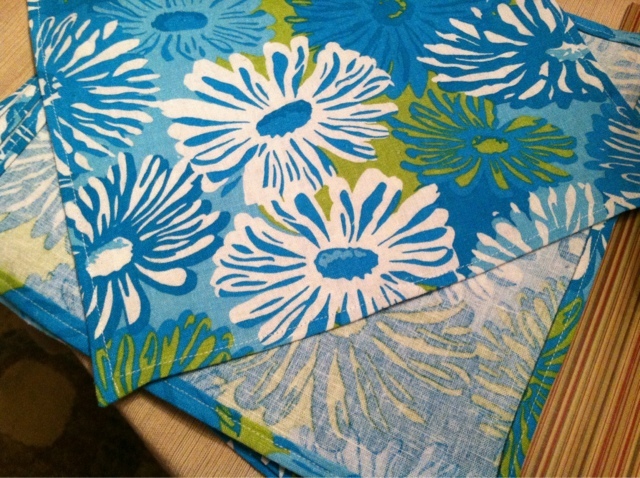 These are the finished napkins!! I'm so excited!! I'm nervous to use the napkins, though. I need to look into whether or not I should do something to protect them from staining. Anyone have any tips? I am feeling very ambitious about my sewing and, today, bought fabric to make a set of curtains for one of the windows in our stairwell. It should be good. I am also thinking of making drapes for the living room because the ones we have up aren't my favorite and I would like, generally, more color in the decor around here. Boyfriend supports my "color initiative," so that's a good thing. Slowly, but surely, I will brighten up our home and make it more homey. I think I'm still getting used to the idea that we won't be moving for a long time. Amazing! This is the first year I haven't moved since... college. WOOHOO!! 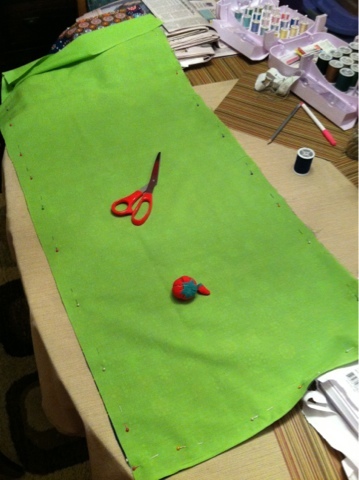 Huzzah for my sewing machine! Huzzah for the napkins! I am happy to see you! Welcome back. Don't take this the wrong way, but I wasn't really prepared for you. Wasn't it just the beginning of August? I like August (no offense!). I want more August. See, I need more August because I didn't get to accomplish all of the stuff I had hoped to. Remember that list I made? And the list I made on my birthday? Yeah... I'm not doing so well with those things. Maybe if you and I can come to terms about all of the stuff I need to get done, things will be easier. I like you. I really do. I like your cooler temperatures and the way the leaves begin to change. I like the crisp scents in the air and the mums that I will inevitably put on my front steps. So let's just get along and I think we'll be alright. Deal? Deal.